You said nothing when your neighbor's dog repeatedly used your yard as a toilet or barked all hours of the night. You didn't react when your friend's canine companion stole your food or muddied your favorite pants. After all, you're an understanding person, and you want to maintain a good relationship. But it's hard to be considerate of the neighbor's pet when you're rushing your child to the emergency room after a dog bite. Patience wears thin when you're watching your little loved one suffer needlessly due to the actions of that animal. These are all valid responses, and an experienced Missouri dog bite lawyer can help you get the compensation you need while ruffling as few feathers as necessary. The family dog becomes very much a part of your family. He eats the scraps of food underneath the highchair and eagerly licks clean those last few crumbs on your baby's hands. He growls at any stranger who would dare approach “his” children and sleeps as close to his favorite family member as possible. Whether you rescued your pet from the pound or watched her grow from a pup, these furry animals have a way of stealing your heart. For that reason, it's even more difficult when your beloved pet turns on one of your own children. Any dog bite that results in serious injury can benefit from the expertise of a St. Louis dog bite lawyer. 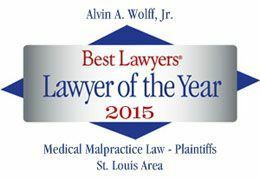 For a free consultation to discuss your matter, call Alvin Wolff, Jr., at 877-241-1020.